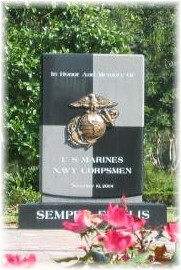 The Marine and Navy FMF Corpsmen Memorial at the Evergreen Cemetery is set in a unique setting and location. It dominates the front entrance of one of the Jacksonville’s historical treasures. Evergreen Cemetery is the burial site of many of Jacksonville’s and Florida’s famous individuals and the resting place of military members of conflicts from our Civil War to the present. The Memorial stands guard over the spirits of all those that served and believed in what makes this country great; it looks out into the community as a reminder of what HONOR COURAGE, COMMITMENT and SACRIFICE are to those who served in and with the Marines. 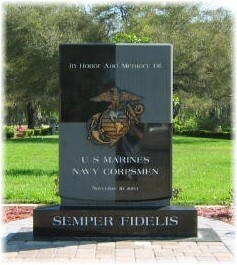 It is the only monument in Jacksonville, a PREDOMINANTLY Navy community, which honors both Marines and Navy Corpsmen. It stands as a beacon for all and especially those that wore the uniform and have forgotten what the “brotherhood” is all about…A Marine brotherhood that could not be complete without the Navy Corpsman. 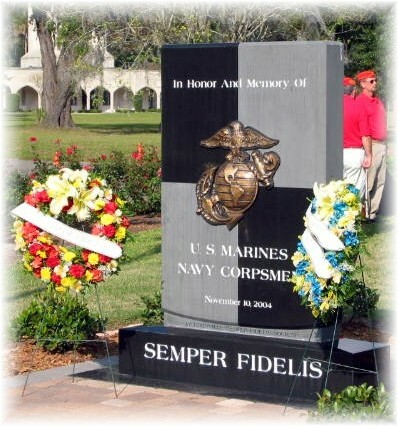 The Memorial was dedicated on November 10, 2004 and is rededicated every November 10th with local Marines and Veteran organizations participating.